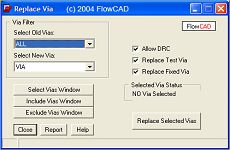 In the FloWare module Replace Via you can select an area in OrCAD PCB Editor or Allegro PCB Editor in which you want to exchange one via type with another one. The selected are will be highlighted to avoid unwanted changes. in a second step you can even change the selection by adding or removing selected vias before exchanging them. In a checkbox you can allow violations of design rules while exchanging vias and if you want to replace test-vias or fixed vias.